Erected by John MCMORRAN in memory of his daughter Christina Thomasina MCMORRAN who died at Marbrack 8th June 1875 aged 22 years. They that seek me early shall find me. Also Adam his son who died at Marbrack 28th May 1879 aged 22 years. Also the above John MCMORRAN who died at Marbrack on the 26th Aug 1893 aged 65 years. 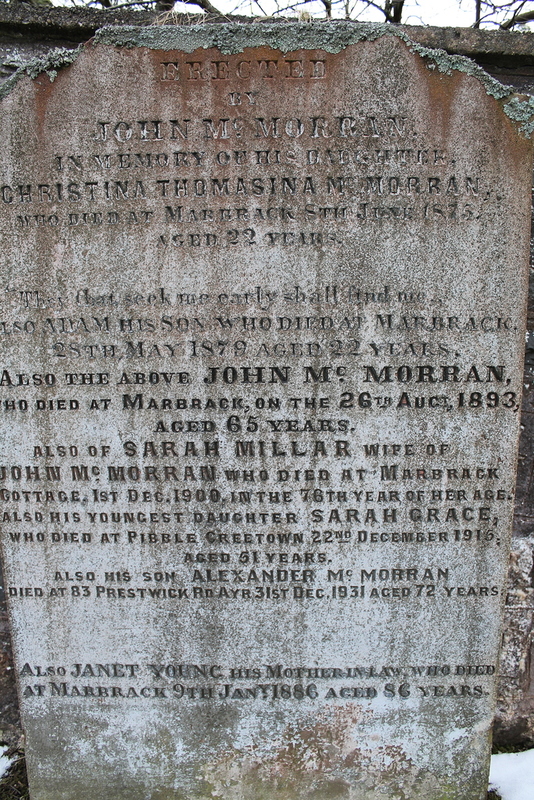 Also of Sarah MILLAR wife of John MCMORRAN who died at Marbrack Cottage, 1st Dec 1900 in the 76th year of her age. Also his youngest daughter Sarah Grace who died at Pibble, Creetown 22nd Dec 1915 aged 51 years. Also his son Alexander MCMORRAN died at Prestwick Rd., Ayr 31st Dec 1931 aged 72 years. Also Janet YOUNG his mother-in-law who died at Marbrack 9th Jan 1886 aged 86 years. GC, “Kirkyard gravestone 113,” Carsphairn Archive, accessed April 20, 2019, http://carsphairn.org/CarsphairnArchive/items/show/222.